My sister-in-law popped over to mine this week with my lovely little niece. She is a whiz with all things glamorous and fashionable, so she is great with hair. Now and again she will braid Little Ladies long hair into a complicated plait. 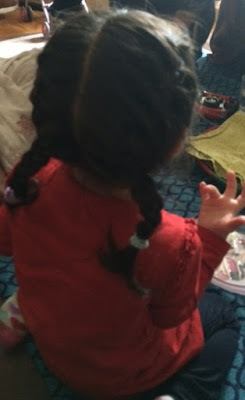 On this occasion she managed to get Darling to co-operate long enough to plait these adorable little braids. I can’t believe how quickly this one is growing up. Gorgeous asked me yesterday if she was still a toddler and I told him she was now an infant. I am still in awe of how lovely she is – Miss Peaches and Cream, nothing like the strong, lean girls in my family. At the moment we are enjoying navigating her favourite answer to everything: “No!” and mediating between her and Gorgeous who insists she is mean to him. I also love that she reminds me of my grandmother who I was very close to, both in looks and nature: feminine, strong, sharp as a tack and very clear that they like doing things a certain way and that everything has its place.